The Rochester native transferred to Miami with high credentials; growing up playing at Oak Hill Country Club and learning the game under the watchful eye of legendary instructor Craig Harmon, she won the 1972 New York State Junior Amateur title and the 1974 New York State Women's Amateur title. While at UM, she would add the 1976 N.Y. State Women's Amateur titles to that list. And, although she would place 2nd in the Lady Paladin Invitational her Junior year, her best was yet to come! During her Senior season, Cathy would finish in the Top Ten in 8 of the 9 tournaments she played, including Top Five finishes at the Houston Baptist Invitational, The Lady Gator Invitational, The Miami Invitational, and again at the Lady Paladin Invitational. The Hurricanes would win five of the nine tournaments, and would finish no lower than 5th in any event ! Here stroke average of 76.36 shots per round was the 2nd lowest in school history, trailing only teammate Carolyn Hill(75.88). But her greatest week would take place far from Miami...on the island of Oahu, Hawaii! 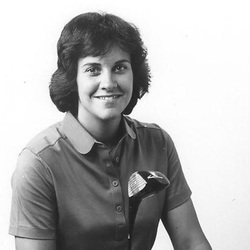 In June, 1977, playing at the Kuilima Country Club, Cathy would fire rounds of 73- 76-74-76 for a school record 299 and a 2 shot victory, her first as a Cane, in the AIAW National Championships ! She became the 4th of Miami's 5 National Champion women's golfers in a 20 year span. Her total bested teammate Mary Lawrence and future LPGA Tour Hall of Famers Nancy Lopez, Beth Daniel, Patty Sheehan and Betsy King ! She also teamed with Lawrence, Hill, Sarah LeVeque and Cindy Kessler to secure a 16 shot victory over 2nd place Tulsa to win the AIAW National Championships Team Title, the first of Miami's back-to-back championships;the only school in history to accomplish the feat ! Cathy was named an All-American for 1977. After graduating with a degree in Liberal Arts, Cathy joined the LPGA tour and would win the 1982 Chrysler-Plymouth Charity Classic in White Plains, N.Y. She retired from the tour in 1992, but still holds her tour membership. She now lives in Palm Beach, Gardens, Fl., works as a realtor for Mirsky Cole & Co., and is a golf instructor at the Golf & Racquet Country Club in Eastpoint, Fl. She has also been inducted into the Pittsford High School Athletic Hall of Fame and the Rochester-Monroe County Athletics Hall of Fame.